I hereby declare that it is now close enough to Christmas that I feel no need to apologize for Christmas titles and posts which you will now be seeing with some degree of regularity around these parts. My guilt is assuaged as the calendar days go by and we march steadily closer to December. Now onto today's book which fills me with a myriad of conflicting thoughts. I don't think I've ever had so much to say about a children's picture book before. I received The Spirit of Christmas: A Giving Tradition for review from Tiger Tales Books. (I love Tiger Tales and their Christmas books in general. Let me just say that from the get-go.) This book tells the story of a young boy named Drew who discovers that there are families at Christmas time who are unable to afford to give presents to their children. He is wounded by this thought and wonders how he might best be able to help some of these families in need. After thinking on it for a bit, Drew decides to send Santa a letter asking how he might share some of his own toys and clothes with others less fortunate. The following morning Drew finds an empty bag under the Christmas tree with an accompanying letter. Santa has written Drew back to say that he has left behind a "giving bag" for Drew to fill up with any special toys or clothes which he might like to share. Santa promises to redistribute the items, spreading Drew's love around to those in need. Drew is very excited by this concept and he begins to hunt around his room for toys and books and games "he no longer played with" along with "mittens that were too small, and pants that were too short" etc. (He does include his favorite choo choo train in the bag as well.) Drew fills up the bag and deposits it under the tree where Santa collects the items. On the whole, it's a fairly cute story about giving to others and spreading a bit of Christmas kindness and cheer around. Now, I have zero objections to Christmas cheer and kindness. Please believe me on that. However, I also don't like it when people try to guilt me in to showing kindness in any particular way which they believe I ought to be showing it. Pressure to conform generally goes over like a lead balloon as far as I'm concerned. That is not to say that I don't think it's important to give to those in need at Christmastime. The problem is that I think too many people think only of giving to those in need at Christmastime and not at any other time of year. Yes! Giving at Christmas time can be extra fun and special in ways which are not possible at other times of year but there is just as much need in April as there is in December and that is my objection to the whole concept of "take your family to the food kitchen NOW" arguments when holly berries decorate all store windows. Although I really do think this story is cute and have no objections reading it to my kids (mostly because we look for ways to serve quietly all year and not just during one month) I sort of have an objection to the idea of giving things that we no longer want. If you want to give something to someone in order to bless them, why not sacrifice a little? Sure, if someone can use something that you don't need anymore, pass it along. But that's not really sacrifice. You were going to get rid of it, you just found a particular person who had particular need of that thing. When I think of giving with a desire to bless, I prefer the idea of giving something that is unique that no one else can give but me and my family. I also really don't want anyone else to notice what I'm doing at the time. The act of giving isn't meant to be a show and it shouldn't feel like anything that is put upon you. Give with joy and gladness when you do give! Spend money buying something brand new that you know another person will be blessed by. Give of your time, your energy, and your creativity! Give, not with the idea of receiving anything at all back but with the JOY of giving something you desired to give. What it really boils down to though is that giving and extending kindness to others is going to look different for each individual. Why? Because we are individuals, that's why. We are each created with different gifts and personalities. We have unique things to offer to this world. The only requirement for each one of us (specifically Christians) is that we do give. We must not be a stingy people for we do not serve a stingy God. He gives liberally, graciously and with great joy. If you look at your own life for a moment, I suspect you will see signs of His joy all over your life. I know it's all over mine and so when I do give to others, I want to give almost ecstatically and also with the hope of creating joy for another. In other words, I'm not going to give away my mittens which are too small and my pants which are too short. Do you want to talk about the true "spirit of Christmas" amongst yourselves and with your children? This "spirit" to which we refer is love come down to sacrifice itself on a cross. It is the gift of life and joy which knows absolutely not a single bound. It is happiness. It is peace. It is victory and the spoils are to be shared with the whole entire world!!! Do you know how to give this way and with this spirit of joyfulness!? Why not!? That's a serious question and one I hope you'll give some consideration to if you are a Christian and choose not to give to others. Remember Who you serve and how you reflect Him and His gift to you to the entire world! I want my children to know what it means to give but the giving will feel empty unless they know how much that they have been given by the God of the universe. In His great love, He sent His son Jesus to walk my road, know my pain and defeat death on my behalf so that I could have a relationship with Him. Christmas marks a time when we remember the gift that was sent to us. Oh, and with what gladness I pray my children receive this gift and desire to share it with others! I don't want the ever to give with any rules, regulations or guilt trips applied but with all of the joy that they hold in their hearts. We freely give because we have been freely given the greatest gift of all. 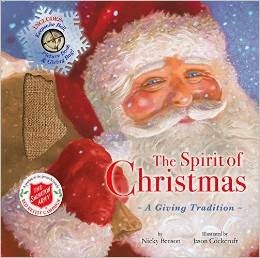 If you would like to win a copy of The Spirit of Christmas: A Giving Tradition complete with bell and bag, please leave a comment below. If you would please include a valid e-mail address, that would be greatly appreciated. This conest is open to U.S. Residents only and will be open through Sunday, November 30th. THIS CONTEST IS NOW CLOSED. THE WINNER, as selected by Random.org, is #6 - HEATHER. CONGRATS! Many thanks to Tiger Tales who not only sent a copy of this book my direction in order to facilitate this review, but were also inclined to pass along a copy to one of my readers. Please note that all opinions shared above are 100% my very own, just like always. I received no additional compensation for this post if you have any doubts on that score. But if she wants to purchase something, I recommend Why Christmas? I like the idea behind this book. I agree with you, but think the spirit of the book might be in the right place.